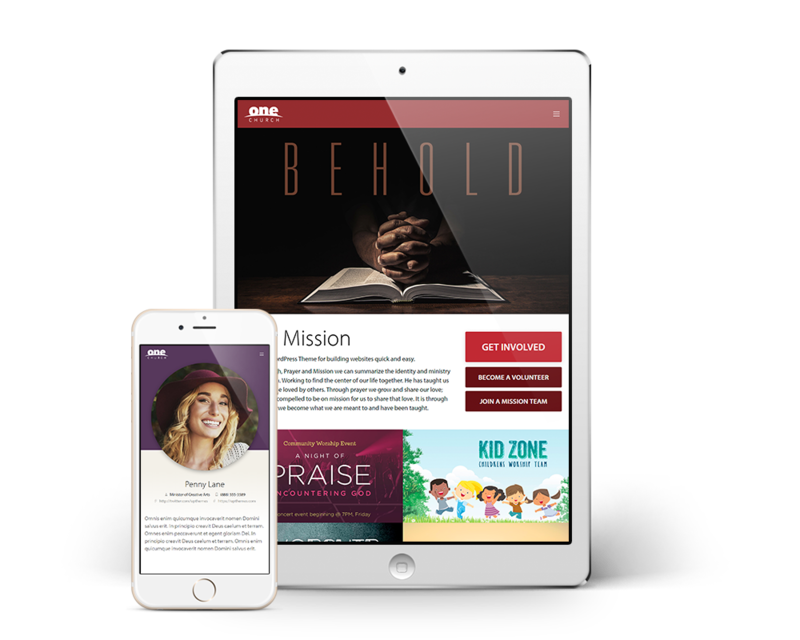 Introducing the One Church WordPress theme, a responsive design with drag-and-drop content, sermons, locations, service times, staff, and event management. 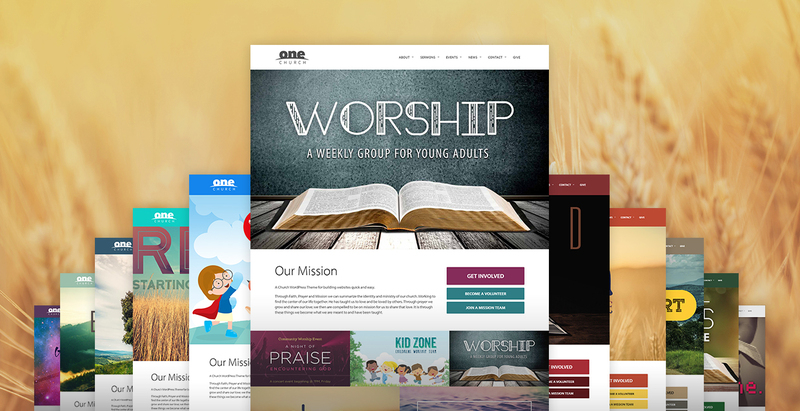 This theme is powered by the Church Theme Content plugin and Church Theme Framework to create a powerful, dynamic and most importantly, beautiful church website. Simply put, this is the perfect church WordPress theme to manage your website. The ease of use combined with it’s extensive functionality make it a powerful tool for creating content. And did we mention it’s beautiful? What we’re saying is, this theme can do a LOT and it looks good doing it. So let’s run through some features that make it the best church WordPress theme and the choice for your website. Sermons – Uploading sermons and posting a series is a breeze with the One Church WordPress theme. Quickly include a video, audio, or PDF file as part of the sermon. Group sermons into series, list speakers and other key details in the published description. Each series has a custom page to list the associated sermons. As an added bonus, the One Church WordPress theme supports podcasts and Atom/RSS feed subscriptions. Staff Directories – Add your staff with the easy to use tools included in the theme. Create staff profiles with photos, descriptions, contact details and more. You can assign staff to groups or teams. Each group can display assigned team members while the main staff page will shows all staff. It is incredibly easy to set up and use. Church Locations – One Church WordPress theme has the tools to help people find you. Whether you have a single location or many, it’s easy to list them all and provide details for each. Every location can include Google Maps, driving directions, photos, descriptions and more. Make it easy for visitors to find and attend services by clicking the built-in “Get Directions” link. Events – It’s never been easier to publish events so your members can keep up-to-date with what’s happening at your church. Schedule regular meetings, weekly services, special events like concerts and picnics or anything else that happens to be on your calendar. One Church WordPress theme makes it easy to find and attend these events. Each event includes Google Maps integration, times, dates and even settings for recurring events with optional end dates. These are just a handful of the great things you you can do with the One Church WordPress theme, for even more features and details about all the things we’ve packed inside this theme, check out the full theme details page. Add videos and audio recordings directly to sermons, blog posts and pages. The theme automatically displays a beautiful styled media player. Upload media files, such as MP3, MP4, MOV, AVI and other common formats. Post video and audio from popular platforms like YouTube, Vimeo, SoundCloud and Spotify just to name a few. Integrated support for Beaver Builder, a front-end content builder. The most popular drag-and-drop page builder plugin for WordPress, allowing you to create unique content and layouts in a few minutes. We’ve specially designed the One Church WordPress theme to work with this incredible tool so you can make your content just the way you want. Supercharge your SEO with Structured Data (schema.org) integration. 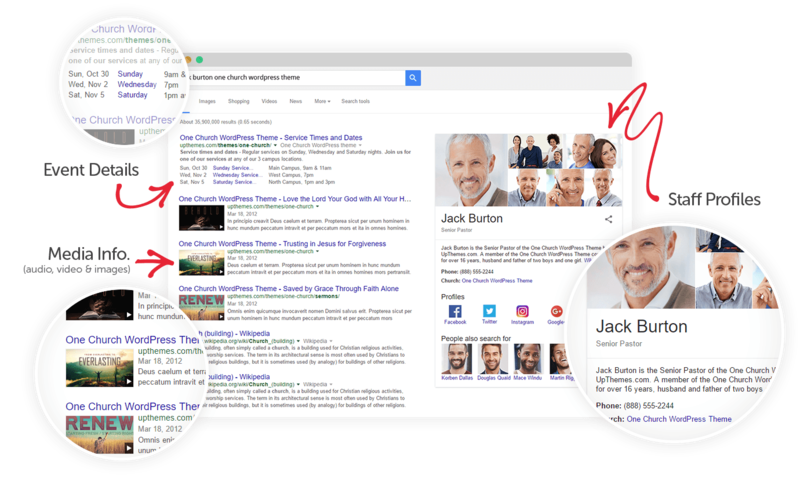 Show detailed results including images, maps and contact information directly in searches on Google, Bing and Yahoo. Optimize your search performance with details about your church, staff, events and more. Even better, the theme does it all for you automatically! We could go on and on, but why not see it for yourself. Congrats on launching One Church. Really nice design and features! Thanks for using the Church Theme Content plugin. I see you guys use the Beaver Builder page builder. Are you using their theme also? Looks flipping awesome! Thanks Andrew! It’s our theme that we’ve made to work with Beaver Builder.